Russell Adrian, D.M.A., has been a member of the Hesston College music faculty since 2015. He conducts the Bel Canto Singers, teaches music theory, and led his first International Chorale on a three-week tour of Europe in May 2016. 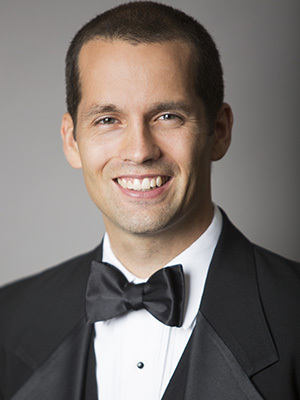 He holds a doctor of musical arts degree in conducting from the University of Minnesota (Minneapolis), master of music degree in choral conducting from the University of Wisconsin-Madison, and graduated from Bethel College (North Newton, Kan.) with degrees in music and mathematics. In addition, Russell serves as the artistic director of The Summer Singers, a chamber vocal ensemble based in Minneapolis, Minn. He resides in rural Goessel with his wife, Camille, and three children, Hannah, Micah and Elijah.